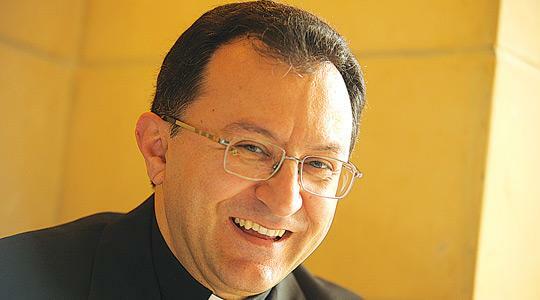 Mgr Joseph Spiteri: his appointment comes at a time of "great hope" for Sri Lanka. The Episcopal Ordination of Mgr Joseph Spiteri, Apostolic Nuncio in Sri Lanka and Titular Archbishop of Serta, was held at St John's Co-Cathedral yesterday, in the presence of bishops from as far afield as Venezuela and presided over by the Vatican Secretary of State, Cardinal Tarcisio Bertone. Immediately following the event, while Mgr Spiteri was surrounded by well-wishers, he told The Times that the role of Apostolic Nuncio of Sri Lanka, at this particular point in its history, was a major challenge and a privilege. Mgr Spiteri aimed to help in the humanitarian crisis in Sri Lanka, both personally and through the Catholic organisations there. "I plan to help the local bishops strengthen the faith and maintain good ecumenical and inter-religious relations with the other communities on the island," he said. The president of the Catholic Bishops' Conference of Sri Lanka, the Rt. Rev. Dr Vianney Fernando, also present yesterday, welcomed Mgr Spiteri, who would be taking up his role as Apostolic Nuncio at a crucial time for his country. "It has been ravaged by a cold war for three decades, causing much suffering," he said. Mgr Spiteri's appointment came at a time of "great hope" for the nation, which was facing many challenges, including looking after the displaced and reconstructing the ravaged areas. The bishop was confident a new Sri Lanka would emerge united, strong and built on justice, equality, freedom and humanity. In his letter to Mgr Spiteri in February, which was read out to applause in the co-cathedral yesterday, Pope Benedict told him he was the right man for the job. Cardinal Bertone said Mgr Spiteri's mission to the far-off land would further strengthen the link between the "generous" Maltese Church and that in Sri Lanka. In the past, he said, many Maltese religious had offered their missionary services there. About seven per cent of Sri Lanka's population of 20 million is Catholic and the Church was being called to play its important role in the current scenario. Since 1983 there was an on-and-off civil war, predominantly between the government and the Tamil Tigers, a separatist militant organisation which fought to create an independent Tamil state. After a 30-month-long military campaign, the Sri Lankan military recently defeated the Tamil Tigers. He has had his fair share of adventures but "that is another story", he said yesterday, before he was overwhelmed by more people wanting to kiss his hand.